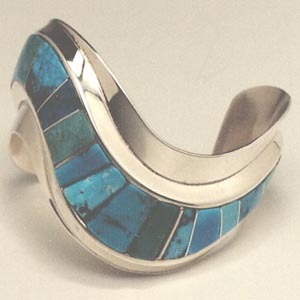 Ophelia Garcia, Navajo, is known for her curved bracelets that seem to hug the wrist and move across a woman’s hand. Ophelia uses the finest quality stones and is considered a master silversmith. She lives on the Najvajo reservation with her husband, artist Ted Draper, and their two children.